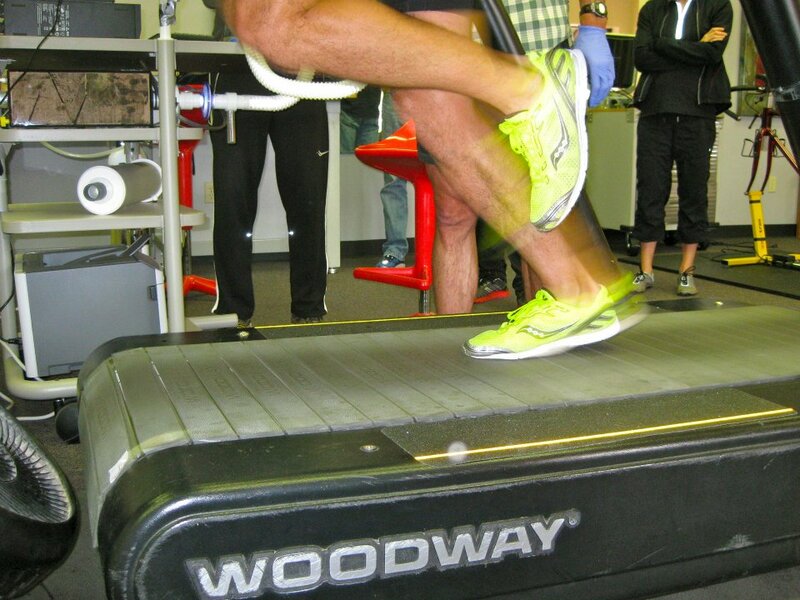 Treadmill Running, Part III – How To Calibrate Your Treadmill | Run S.M.A.R.T. On the edge of your treadmill running belt make a starting mark with a pencil (have the TM power off at this time), and lay a measuring tape or ruler on the running belt, starting at this mark. Push the running belt slowly around, making small pencil marks when needed and record the accumulating distance from your starting point. Continue measuring until you reach the mark where you started and record the total distance, to the nearest ¼ inch or .5 centimeter. If you are measuring in feet and inches, calculate the total distance in inches and multiply that value by 2.54 to get centimeters. Let’s say, for example that you end up with a running belt that is 542.9 cm. Convert the cm distance to meters by dividing the cm distance by 100 – 5.429 in the example above. Multiply belt length by 10 to get the distance traveled in 10 belt revolutions. Example: 5.429 X 10 = 54.29 meters. Place an identifying mark on the edge of your treadmill running belt; one that can be seen when the belt is moving fast. If it is your own treadmill you may want to put a spot of white paint or white-out that is easily seen and will stay put for some time. White tape can work, but sometimes will not stay put when the belt gets going. Exact speed of the TM belt is determined by timing 10 revolutions of the belt, as follows. With the TM running approximately at the speed you want, pick a spot at which you will start timing the white mark as it passes that spot. I often just start and stop timing as my white mark disappears over the back of the TM, but this is hard to do if timing yourself running. It is best to do the belt timing with the person running on the treadmill who is going to train or be tested since body weight will slow some TM belts down due to friction of a person on the belt. Have someone else do the timing when you are running. Start a stopwatch as the white mark reaches the designated spot and say “zero” to yourself. Count 1-2-3-4-5-6-7-8-9-10 for the next 10 times the white mark arrives at your designated spot and stop the watch when you say the number “10.” You may want to time 10 revs a couple times to see if you are consistent. Remember to start with “zero” when you start the watch. Let’s say your watch says 13.03 seconds for those timed 10 revolutions. If you want a particular speed, then you can calculate the T needed for that speed as follows: (D * 60)/ m/min = T EX: for 268 m/min 54.29 * 60/268 = 12.15 seconds. In the example above, 268 meters per minute speed (6:00 mile pace) is achieved by adjusting the TM speed until you get the time of 12.15 seconds for 10 revolutions. I usually try to get close to specific speeds, but don’t spend too much time trying to hit a specific speed; rather just record the speed that is close to what you want and when you plot your data on a graph just use the speed you were actually running at. It is also nice to know what MPH you want to set the TM belt at. More info about Dr. Jack Daniels online training here. Customize a training plan for your next race from legendary Coach Daniels here.